Walkie-talkies are used in our society for a variety of purposes, ranging from public safety to personal recreational use. Walkie-talkies are a great tool to have when communicating with friends and family, whether you are hiking through rugged terrain or playing a neighborhood game of capture the flag. There are several fun walkie-talkie games that both children and adults can enjoy playing that will provide hours of excitement! Using walkie-talkies during scavenger hunts is a great option to enhance a favorite childhood game. There are several ways to set up a walkie-talkie scavenger hunt. You can set the hunt up with teams where each group has their own walkie-talkie, and throughout the hunt, they use them to communicate with each other about their location and progress. Another way to incorporate walkie-talkies into a scavenger hunt would be to have a person or group stationed at the final clue to give hints and clues to the other teams searching. Playing capture the flag is the perfect excuse to put your walkie-talkies to use! In this game, there are generally two teams with a goal of outsmarting each other and stealing the other team’s flag. 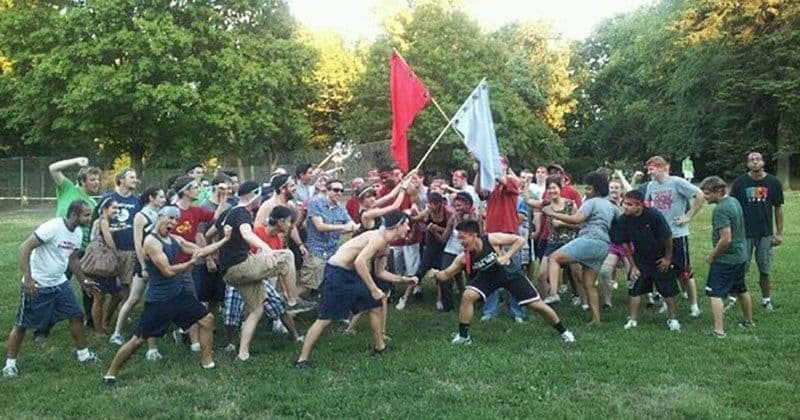 Capture the flag is typically played over large areas, and it can be difficult to coordinate large-scale groups. By using walkie-talkies, each team can use a designated channel so members can be in contact with each other throughout the game to coordinate strategy and location to sneak up on their opponents! A staple of childhood, playing with your friends by pretending to be spies, police officers, explorers, and secret agents is hours of fun for everyone! Walkie-talkies only make these games better by adding an entirely new element to your top secret missions. Whether you are communicating with fellow secret agents in walkie-talkie lingo or hiking through the woods on a grand adventure, adding walkie-talkies give a level of authenticity and safety to every game you play. Add a whole new element of fun to your hide and seek games by adding walkie-talkies! By giving walkie-talkies to all the “hiders”, players can coordinate their secret hiding spots and take the game to a new level of challenge. Alternatively, two “seekers” can be used in the game, and they can use their walkie-talkies to communicate with each other as they find all the players hiding. Another benefit to adding walkie-talkies to a simple game of hide and seek is that it allows the players to spread out over a much greater range. Get your whole neighborhood involved and see where the fun will take you! Walkie-talkies are useful devices in many different applications, but they are also able to take simple recreational fun to a new level of exciting play. Through organized games like capture the flag and hide and seek, children and adults alike can have fun and build their leadership and teamwork skills. Walkie-talkies can also add a new element of fun to role-playing games, like pretending to be spies and secret agents. When it comes to incorporating walkie-talkies into games with family and friends, you are only limited by your own imagination! We've create a buyer's guide that will tell you everything you need to know to buy the perfect walkie-talkie. How Does An FM Transmitter Work? Do All Walkie-Talkies Work Together?